ELECTRONIC BLOCK TRADING IS NOW A FEATURE OF THE MARKET. 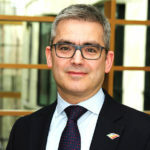 Dr Robert Barnes, Chartered FCSI, Global Head of Primary Markets & CEO Turquoise, London Stock Exchange Group. Turquoise Plato Block Discovery™ has become the mainstream electronic multilateral anonymous block trading mechanism, today fully automatic with no manual firm ups nor manual’s related fading. 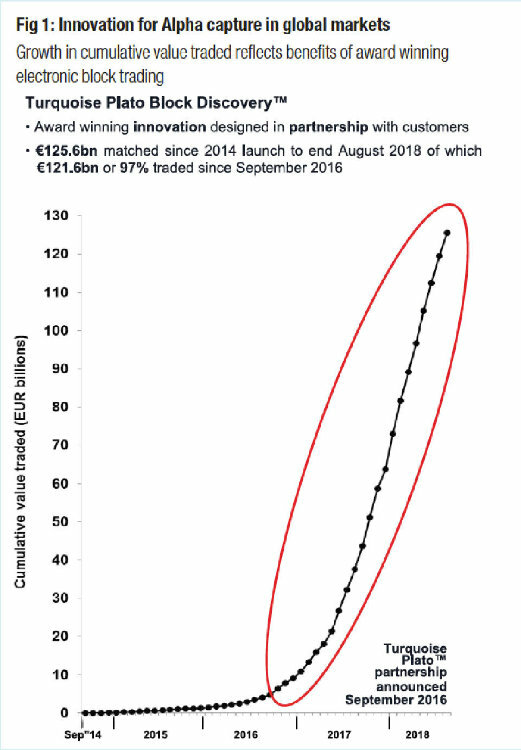 Growth in cumulative value traded reflects benefits to investors with Ä125.6bn matched since the 2014 launch to the end of August 2018 of which Ä121.6bn or 97% traded since the September 2016 co-operation announcement with Plato Partnership (see Fig 1). Intraday, the most active half hour of Turquoise Plato Block Discovery™ is the first half hour, with a reasonably even distribution for the balance of the day. This morning activity encourages users to enter Block Indications early in the trading day. The liquidity profile of Turquoise Plato Block Discovery™ is an excellent complement to that of primary stock exchanges where liquidity events concentrate in the closing auctions at the end of the day. 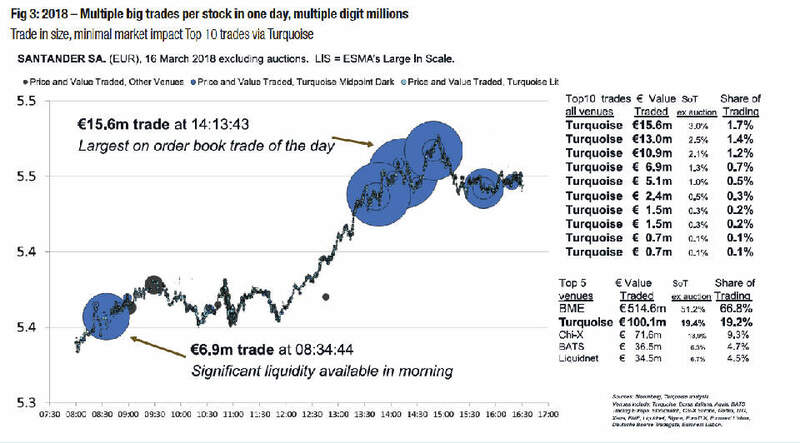 Already the leader in Large In Scale activity, in 2016, members using Turquoise Plato Block Discovery™ routinely achieved a single big trade in a single name on a single day (see Fig 2). Into 2017, it became routine to achieve multiple single digit million trades per stock in one day. 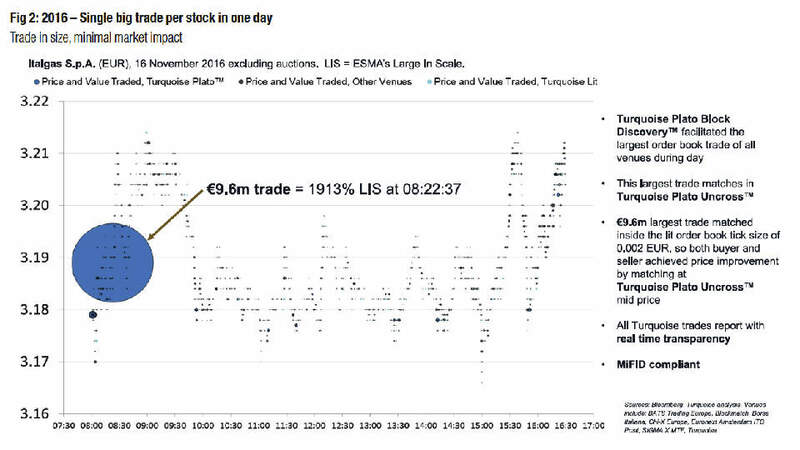 By 2018, multiple big trades per stock matched in a single day, with sizes growing to multiple digit millions (see Fig 3). The average size of trades matched via Turquoise Plato Block Discovery™ has continued to rise. 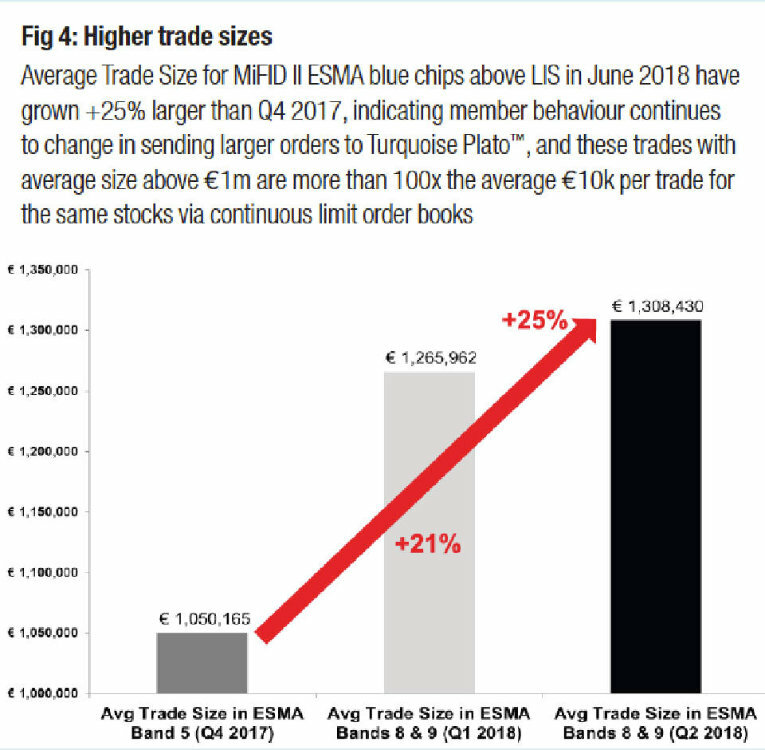 For ESMA blue chips with Large In Scale thresholds of Ä500,000 or more (Band 5 in MiFID I and Bands 8 & 9 in MiFID II), average trade sizes have grown more than 25% by Q2 2018 compared with those of MiFID I Q4 2017. 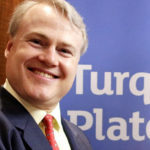 This shows investor behaviour continues to change, sending larger orders to Turquoise Plato Block Discovery™. These trades with average size above Ä1m are more than 100x the average of Ä0.01m per trade for the same stocks via continuous limit order books (see Fig 4). The largest single multilateral order book trade via Turquoise Plato Bock Discovery™ has been Ä17.3m. That said, the largest single Block Indication resting in Turquoise Plato Block Discovery™ that partially executed was in a single stock with a size of Ä180m. 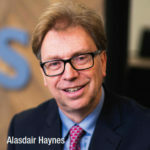 As a result Turquoise has raised its ceiling for order entry to Ä200m or £200m, depending on underlying currency. At the request of members, Turquoise launched in December 2017 its next intraday trading innovation in partnership with customers. Turquoise Lit Auctions™ subsequently grew its activity from Ä1m value traded in January 2018 to more than Ä1bn in June 2018. Some market regulators have expressed interest and scrutiny of other venues for the amount of same member–member bilateral matching they claim to process via their periodic lit auctions. Turquoise granular analysis has shown its own Turquoise Lit Auctions™ are truly multilateral. During August 2018, Turquoise Lit Auctions™ matched a total of 105,826 trades, of which only 7 trades were same member on both sides within the same maximum potential 100 millisecond randomised window for matching and with the same size on both buy and sell. This means orders sent to Turquoise Lit Auctions™ are likely to interact fully with all liquidity available in Turquoise Lit Auctions™ on a truly multilateral basis (see Fig 5). Turquoise Lit Auctions™ also feature a wide range of order sizes that can match – large and small. 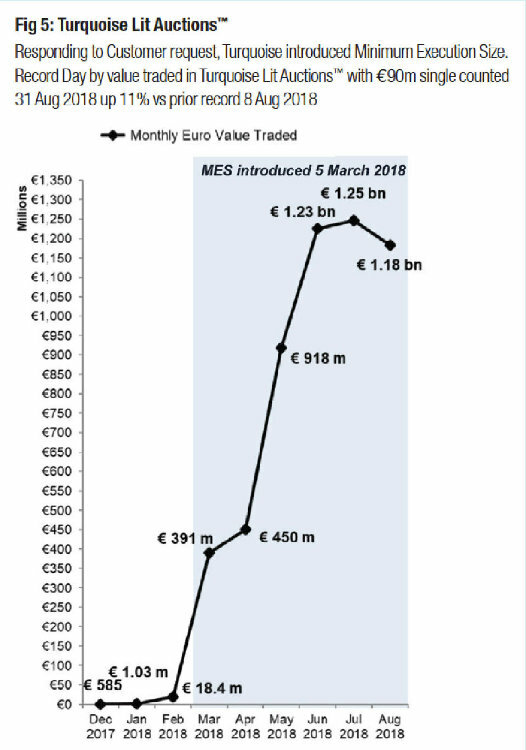 While the average trade size was Ä11k in August 2018, Turquoise Lit Auctions™ also matched trades in various millions. The largest Turquoise Lit Auctions™ trade recorded more than Ä10m. More than 8% of value traded is above Large In Scale with trades above Ä500,000 observed in instruments from 12 different geographies during the month of August 2018. At Turquoise, we share our core principals with London Stock Exchange Group: integrity, innovation, partnership and excellence. 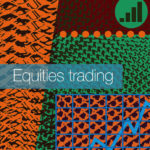 The primary objective for Turquoise is to be the multi-jurisdiction securities trading venue of choice. With an ageing population and an increasing reliance on private sector pensions in Europe, capital markets need to be competitive to deliver meaningful long-term investment returns. With European interest rates and investment returns near zero, the focus is on efficient trading to minimise cost and enhance long-term investment returns. At Turquoise, our focus is to listen to customers and prioritise how we can help them to meet regulatory obligations, reduce costs and generate revenues through new business initiatives which are developed in partnership with Turquoise. 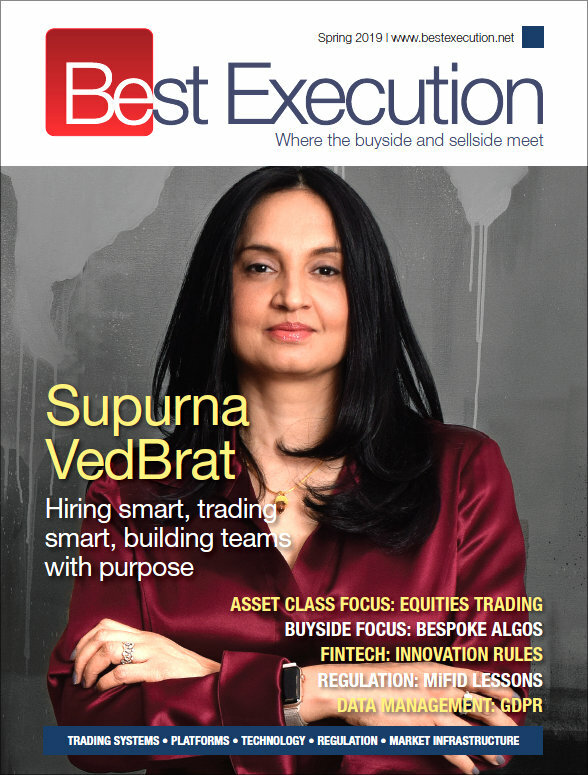 Key investment trends are the search for growth and the complementary desire to outperform benchmarks by trading quality liquidity through electronic trading channels like Turquoise Plato Block Discovery™ and Turquoise Lit Auctions™. We are listening and responding to this demand with innovation and open access.